USDA Organic. 3 varieties of organic tea in each box: Mango-Peach, Passionfruit-Orange, Pineapple-Strawberry. Mango-Peach, Passionfruit-Orange Ingredients: Organic green tea, organic black tea, 100% natural flavoring. 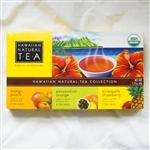 Pineapple-Strawberry Ingredients: Organic green tea, organic white tea, 100% natural flavoring.